Posted on June 3, 2016 at 10:07 am. Yoga to me is an adventure. I know I’m practicing when I am awake to opening. Like science, sometimes the process of daily experimentation can seem miniscule, repetitive, even tiresome. But from a small discovery, the world can change. At Yasodhara, we explore what we presume to know or what has remained unexplored. What are the messages of our minds and our bodies, the secrets of our hearts? What happens when we question our potential and our fears? What becomes of the world if we open to the possibility of peace and community? At the Ashram, we are on the edge of an experimentally advanced Temple – “nothing level, nothing plumb” – a curved goddess of a Temple, preparing to manifest. Our programs are blending worlds of personal development and professional integrity to deepen both. New people are arriving and old friends are returning. What is constant is support for personal and spiritual discovery, an invitation to learn and a challenge to give back to life. We hope you join us for this exciting time! 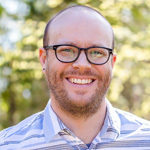 Six years ago, the Ashram leadership contacted Dan and I saying, “We feel a growing need to support the changemakers in the world – would you like to come and help?” As consultants working in organizational and leadership development, we both resonated with the intention and jumped on the opportunity. After ten years of working with changemakers in various domains, we have noticed an increasing drive to find rapid solutions to the swelling complexity facing our organizations, our communities and our planet. We simultaneously recognized that people are reporting an increase in anxiety and even burnout from the pressure to reach higher, work faster and be stronger. Change work is no different; the missing piece is often the lack of time for reflection and the inner rebalancing needed to persevere in creating a better world. 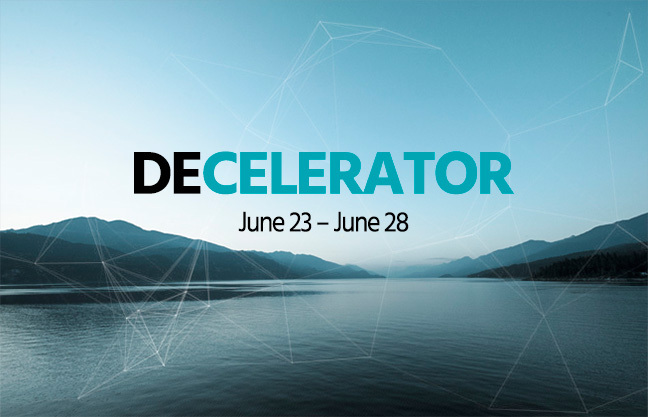 The Decelerator Retreat is an opportunity for professionals to slow down, check in, rebalance from the inside out, and align inner intentions with outer realities. See more in the 2016 Program Calendar online and in this programs-at-a-glance poster. 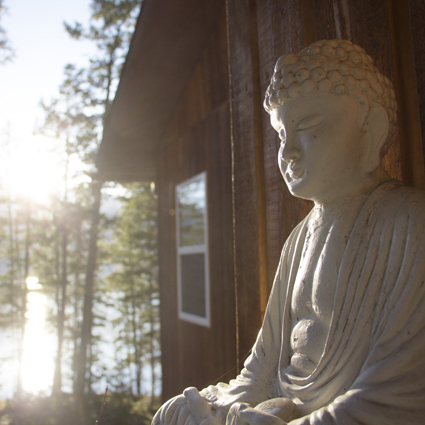 In this retreat, you will focus on going inward, stilling the mind and body, connecting to your inner source of peace, harmony and joy. Each day you will go deeper into a relaxation practice to emerge renewed and full of Light. Re-enter your life with sustaining practices to keep the relaxation, with all of its benefits, alive. 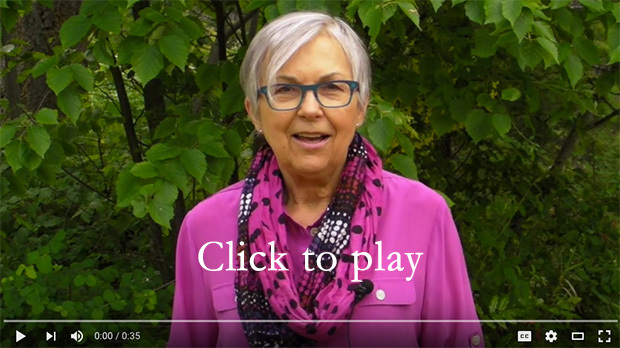 Give yourself ten days to expand your understanding of who you are and who you want to be – ten days of reprieve from stress in a safe and nurturing place of reflection. For students of all levels, this course offers practices that support your personal and spiritual development. 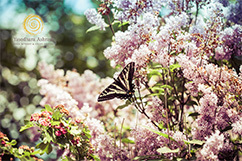 This extended retreat allows time to renew, reflect and reconnect to yourself in an environment dedicated to spiritual well being. 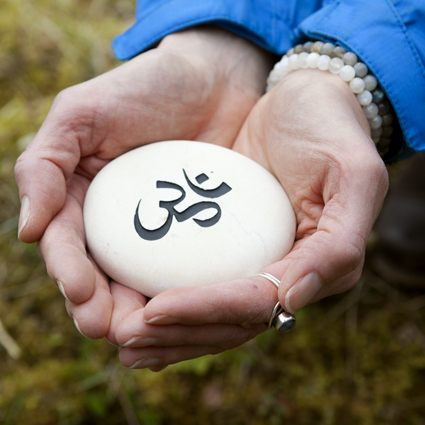 Explore the benefits of a blend of gentle Hatha Yoga, relaxation and spiritual practice. How do the teachings of yoga help us create the kind of world we want to live in? 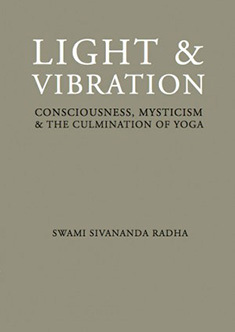 Using Swami Radha’s book, Light & Vibration as inspiration, you will embark on a quest to seek the unity of yoga by deconstructing concepts and opening to awe and wonder. Delight in a more expansive understanding of yourself and open to a more subtle perception of the world. Personal Retreats, Artist and Professional Renewal Retreats and Karma Yoga are available year-round. Our popular Taste of the Ashram program runs at least once a month on Saturdays. Special Offer: Pay What You Can – 2016 only! Our Three-Month Community Immersion Program is a Karma Yoga program designed to give you a deep dive into community living. You will learn about yourself, your values, your approach to work/service and the dedication and support it takes to create harmonious communities. Also a unique opportunity to be part of the momentous time of the Temple Rising! Click here for more information and for the application. Only have one month? Click here. It’s in the air, with experimental pieces becoming tangible! Spearhead, the locally-based but internationally-reputed fabrication company, has created two mock-ups, which we will be reviewing this week with architects, structural engineers and the construction manager. The mock-ups, each 1/7 of the overall size of one “petal,” are scale models of two of the more complex parts of the petal structure of the Temple. The mock-ups will help determine if there are corrections or efficiencies that can be made before moving to actual construction. Check out their beautiful working drawings here. Swami Premananda had a sneak preview last week and says, “Gef, the project lead, explained the process and how the pieces are oriented. Pretty impressive! They are excited about how it is going and enthusiastic about our meeting.” Here’s a one-minute video to get a sense of it. 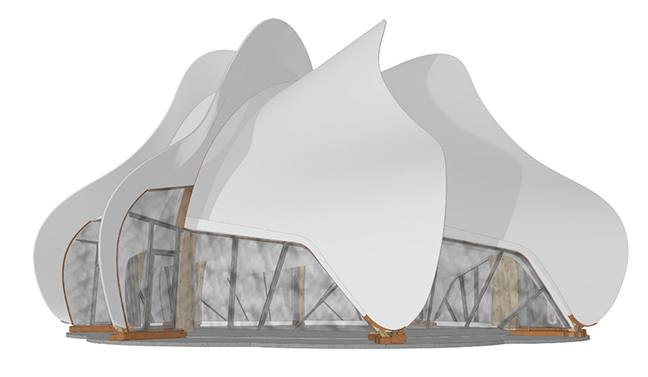 With the Temple now at the cusp of construction, help us raise funds for its completion! Recently Ashram residents pooled our own resources and donated $43,500 to the Temple rebuild! Now we challenge you to match our gift so together we raise $87,000. Help us make this dream come true – manifesting a Temple of Light, a symbol of peace and unity, a sacred space for all traditions to come together. As of June 1, one week into the campaign, together we have raised $12,500. Only $31,000 to go! This challenge ends June 8 at midnight. Act now – make your donation today and help us reach our goal. Follow the Ashram on Facebook and Twitter to hear other residents tell you what motivated them to give. The Temple belongs to all of us. Thank you for giving your support today! 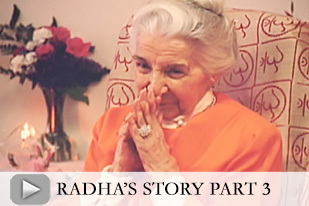 The final installment of Swami Radha’s inspiring biography is now available to watch for free online. Watch Part 1 and Part 2. Multidisciplinary artist Michaela Bekenn experienced a transformative journey in music and song during her Ashram Artist Retreat in April. When I first arrived I went to the water’s edge and the doors opened. Song came pouring through me and I recognized it wasn’t from me alone. 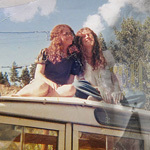 It was from something higher – and reminded me of my first song-writing experience at age 16. Dwelling among nature’s subtleties here, I find my mind absorbs the atmosphere – the curvatures and the angles and the textures. The quality of air infiltrates my system. Nature takes me to a place beyond word and language; then I return to music and to song, which I consider to be my first language. Living in Creek Cabin allowed me to wake up and fall into dream to the sound of flowing water. Being close to the flow of nature brought the sense of never arriving at a single destination but always being in transit – “forever arriving” as a favourite poet Octavio Paz wrote. Nature here also brought a sense of being safe and free to be exactly who I am. The Ashram community – so wonderfully intergenerational – was another important aspect for me. 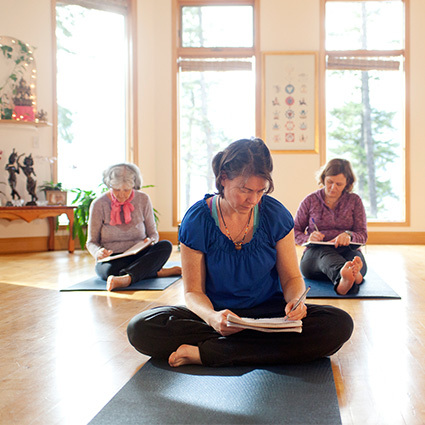 My times of solitude were well balanced with community at satsangs, Karma Yoga and workshops. 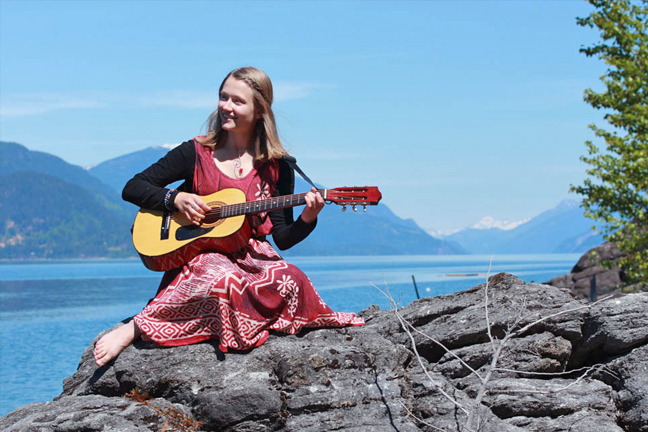 Listen to Michaela’s live performance of “Kootenay Bay”. Here is the latest from our blog, Change Yourself, Change Your World. 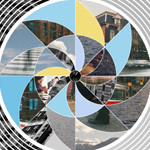 You can also sign up to receive email updates as new posts are published (sign up form is on the sidebar of the blog). 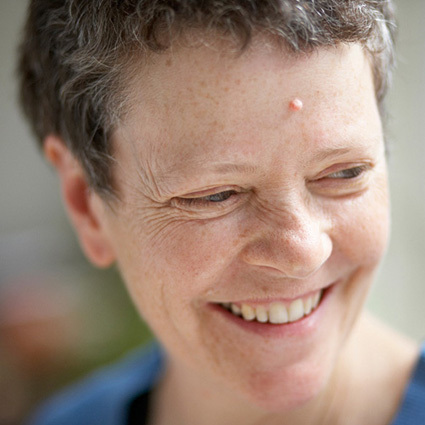 Swami Lalitananda reflects on her fascination with the mind and how her sister’s mental illness shaped her exploration of her own mind. Bryn Bamber reflects on where she found yoga back in the city after her extended stay at the Ashram. Devin Biviano recently completed his Masters degree in Peace Studies & Conflict Resolution. He reflects on how his time at the Ashram has informed his study. Also watch for others dates and locations, including Calgary from Oct. 28 -30. Conference Participation coming up! 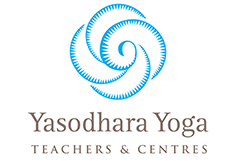 – We are excited to announce that Swami Lalitananda and Alicia Pace will be presenting Yasodhara teachings at international conferences this year. Swami Lalitananda will present “Cultivating Compassion through Peace,” at the International Peace and Justice Studies Conference on September 22-24 in Nelson, BC. Alicia Pace will be presenting “Intersectionality of the Senses: A Yogic Perspective” at the International Transformative Learning Conference in Tacoma, Washington on October 20-23. We look forward to building new relationships in these communities of Peace and Transformational Learning. Do you know of a conference or event that the Ashram could participate in? 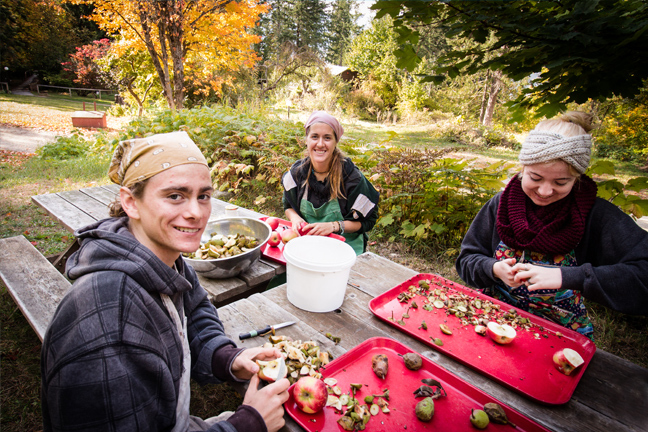 Please email any opportunities to outreach@yasodhara.org. Ashram teacher wins writing award – Congratulations to Alanda Greene who was recently honoured with the 2016 Richard Carver Award for Emerging Writers. Alanda is the author of the novel Napi’s Dance and is currently working on her second novel. Annual General Meeting – On May 6th, we held our AGM with over 60 people in attendance. After the review of the past year, we had a lively multigenerational group discussion about future directions, and were also treated to an inspiring virtual tour of the Temple design by the architects. Generosity to Temple – Kabir and Mirabai hosted a Zikr, a moving meditation practice based in the Sufi tradition, in April and raised $1600 in donations. Bryn Bamber and Francesca Cogorno both raised funds by asking family and friends to donate to the Temple in lieu of personal birthday gifts this year! And Sara Torrie, who has returned to the Ashram to work this summer after years of managing her own business, is offering tailoring service on her reflection day, with donations going to the Temple. Thank you to all! Transitions – Experience how yoga can support you in times of ending and beginning, change and transition with the following practices and reflections. Gratitude – Experience the gift of gratitude through the following reflections.